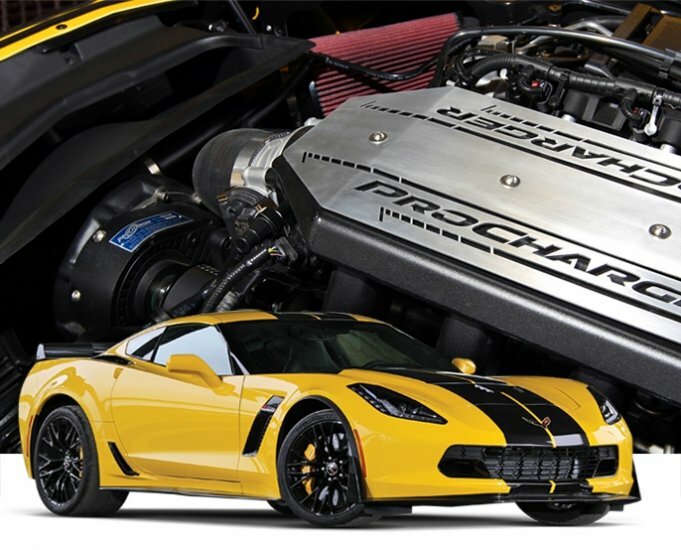 ProCharger was the first supercharger manufacturer to design and release an air-to-air intercooled supercharger system for the C7 Corvette Stingray, but we didn’t stop there. ProCharger now has a robust centrifugal supercharger system offering for Chevrolet’s ultimate supercar–the 2015-16 C7 Z06 Corvette. Our 2015-16 Corvette C7 Z06 High Output Intercooled Systems with P-1SC-1 are supplied with proven tuning calibrations and a handheld programmer set for a 115+ horsepower gain over stock, on 10 psi of boost and pump gas. Higher boost levels and horsepower gains of 825 HP are possible with an Intercooled Tuner Kit on 13 psi and custom tuning, and even higher for custom racing builds equipped with a ProCharger F-Series supercharger model up to the 10.5” volute (F-1X and F-2), all without the need for additional brackets. ProCharger designed and built a custom LT4 sheet metal intake manifold to replace the factory roots supercharger. This intake manifold is a direct replacement for the factory manifold–you simply unbolt the factory blower and drop the new intake in its place. This intake features CNC billet intake runners and base plates, as well as thick-wall sheet metal built to withstand high amounts of boost. We set out to not only optimize flow and power potential, but also ensure the factory hood line was maintained. This robust manifold is also compatible with LT1-equipped C7 Stingray Corvettes. From mild to wild, ProCharger has a supercharger head unit ready to support whatever power level you desire. The base system comes with the super-efficient P-1SC-1 supercharger, capable of 725 RWHP (825 HP), and race systems are available up to the F-2 unit which can support 1,600 HP. Each ProCharger supercharger model features our patented self-contained design with its own internal oiling system, and is built out of aircraft grade billet aluminum for the ultimate in reliability. ProCharger performed rigorous testing to design the ultimate air-to-air intercooler for the C7 Corvette platform, including road course, drag strip, street traffic, and in-lab testing. By putting our intercooler systems through its paces we were able to ensure the coolest charge air temperature and safe engine-operating temperature, all while leaving the C7’s factory-engineered aerodynamics in place. The installation of our C7 and C7 Z06 HO Intercooled Systems is 100% reversible, with no permanent modifications needed to the vehicle. The factory supercharger and supporting components/hardware are easily unbolted and removed and can be reinstalled just as easily. From our bolt-in intake manifold, blower bracket, to the air-to-air intercooler system, everything is 100% plug-and-play. No cutting, bending, tweaking, or trimming of any kind is needed.